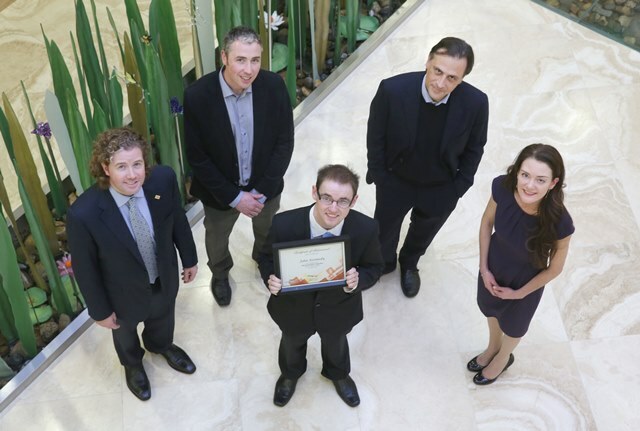 Global animal health and nutrition company Alltech is delighted to announce the 2014 winner of the Alltech Innovation Competition hosted at its European headquarters, Dunboyne, Co. Meath. Waterford Institute of Technology (WIT) student John Kennedy was awarded the overall prize for his outstanding competition entry - Field Buddy. The concept android app, Field Buddy, will allow farmers to avail of GPS technology when fertilising their fields. A total of six universities battled for the prize fund of €4,000 while runners-up each received a cheque for €1,000. WIT’s winning entry showcased a concept that has the potential to improve costs and efficiencies on farm while encouraging sustainable environmental practices. Facilitated by Professor Damien McLoughlin, UCD Michael Smurfit Graduate Business School, the competition celebrates business and entrepreneurship, and challenges the creative minds of university students. Teams from University College Dublin, Dublin City University, Dublin Institute of Technology, Trinity College Dublin, Waterford Institute of Technology and University of Limerick each presented forward thinking business plans on their innovative ideas in the areas of agriculture, distilling, human health and long term environmental sustainability. The competition was opened by Dr. Aofe Lyons, director of education initiatives at Alltech and judged by Frank Mulrennan, CEO of Celtic Media Group, Constantin Gurdgiev, economist and lecturer at Trinity College Dublin and Declan Coyle, one of Ireland’s most internationally experienced leadership and development consultants. “These young people are a reflection of the talent and potential that Ireland has to offer” said Dr. Aoife Lyons. “Alltech are known for working with our customers to identify problems and providing natural solutions. This year’s competition entrants displayed real insight, talent and knowledge. By combining academic expertise with innovation each group had a potentially viable product to bring to market”. Alltech continues to work with Irish universities to ensure the development of talented and educated Irish agri-business graduates. Last year’s winners, AgTeCH4 from the University of Limerick, won the overall prize with their personal gas detector, a device designed to detect poisonous gasses released from slurry on farms. AgTeCH4 are currently developing their company through University College Cork's Graduate Business Innovation Programme 2014, IGNITE. AgTeCH4 is hoping to launch their product on the market later this year and is currently undertaking research for the development of future devices. Dr. Pearse Lyons, founder and president of Alltech, will make an exciting announcement in conjunction with the Alltech Innovation Competition at the 30th Annual Alltech International Symposium in May. An innovation fund shall be created by Dr. Lyons, in a personal capacity, with a view to assisting budding entrepreneurs in the food and drink sector to assist bringing their innovations to reality. “I am in the process of creating a new fund as a way to remove the roadblocks which hinder innovation and entrepreneurship in the food and drink industry” Lyons said. “I will personally donate $500,000 to aspiring entrepreneurs, who present economically viable, innovative ideas to our international expert judging panel. My new fund will be awarded to those with inspiring ideas, in accordance with guidelines set out in the soon to be published prospectus. The fund is the perfect partner to our Alltech Innovation Competition which is run annually in both Ireland and Kentucky. Innovation can start at any age, you just have to be ready for it” concluded Lyons. Click here for more information on the BSc in Agriculture.